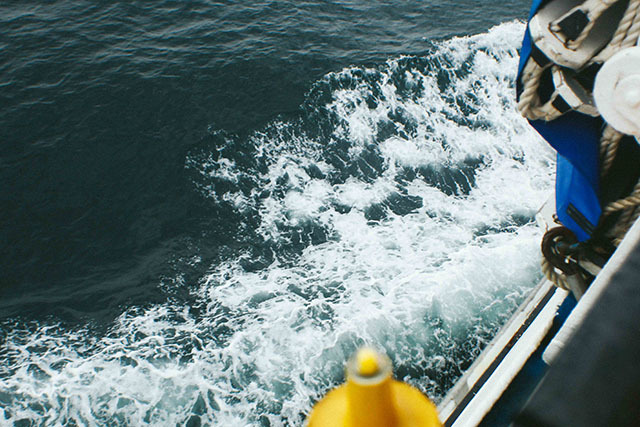 Photographer Jacob Little shares words and pictures from a trip on board The Scillonian III. 7’o clock in the morning. The Scillonian III glows amidst overcast calm as preparations for the day’s sailing gets underway. As blurry eyed passengers congregate on the quay, the place wakes up; forklift trucks deposit blue crates of freight on to the ship and expectant passengers comment on the sea conditions or prevailing wind in an excitable babble. Coffees and bacon baps at the ready – Penzance Quay springs to life. Among the crew, routine kicks in, and the delightfully repetitive nature of daily sailings adds to the atmosphere. 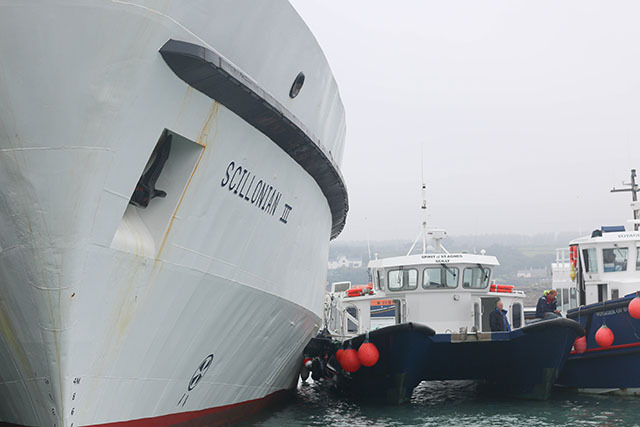 The Isles of Scilly, and indeed Penzance, rely on the Scillonian III and for nearly forty years, she has been ploughing the often treacherous waters to provide valiant service to their remote community. 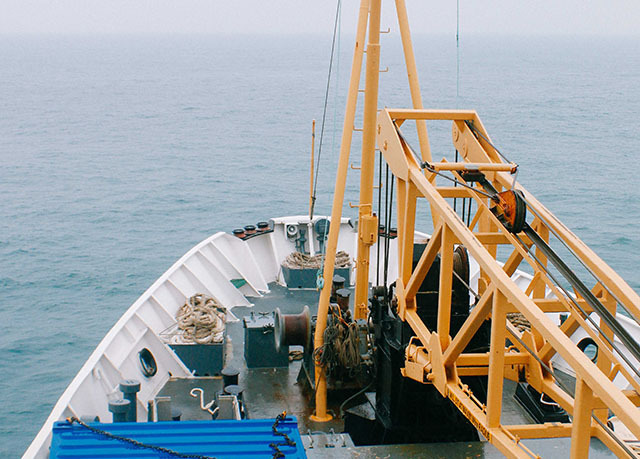 Everyone understands the importance of this ship, whether visitor or regular traveller, and it’s clear that life would not be the same on either the Isles of Scilly or in Penzance without it. 09:15 (except for special sailings or tides) and the ship sounds two blows of her horn and she’s untied, slowly making her way into the often deceivingly peaceful waters of Mount’s Bay. 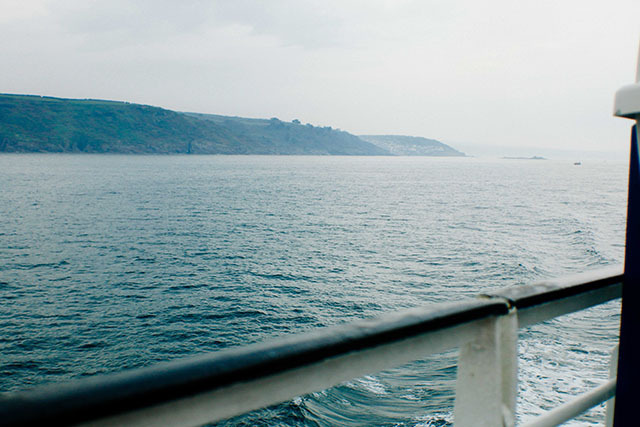 It is a serene picture as passengers congregate on deck to watch the gentle passing of the Southern Cornish coast. As Penzance disappears into the distance and St. Michael’s Mount fades into the morning mist behind us, the beauty of a calm morning trip along the coast becomes apparent. First, Newlyn and Mousehole and latterly Lamorna, Porthcurno, the beautiful Minack Theatre and an ever dwindling amount of houses or dwellings towards Land’s End. As the land peters out, the 28 mile stretch of water between Cornwall and the Isles of Scilly opens up in front of the Scillonian as she makes track towards Hugh Town on St. Mary’s. The waters open up and a range of wildlife show themselves – from dolphins riding the wake of the bow to a variety of seabirds including the rare Manx Shearwater and Storm Petrel. Occasionally, more exotic species can be seen, such as ocean sunfish, and it’s a tradition on the ship that wildlife volunteers and survey experts keep tabs from the bridge on what can be seen. 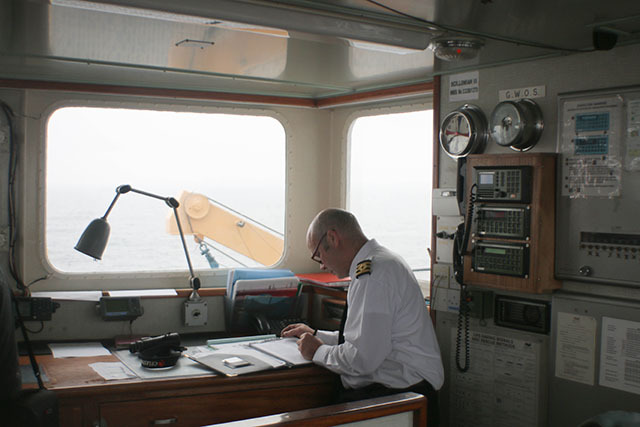 Today, the ORCA survey are on board, and it’s their job to understand the numbers of species that can be seen along the route. 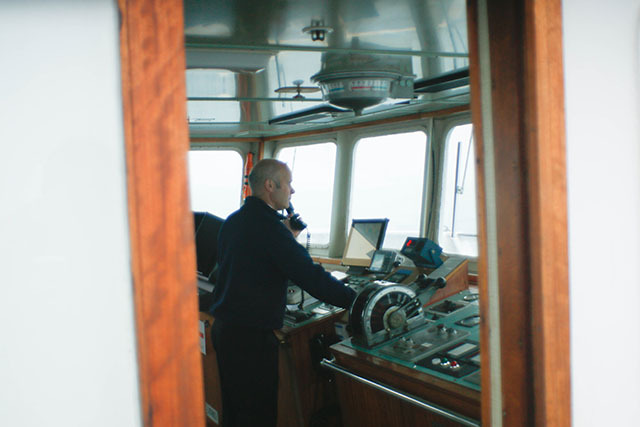 The stretch of water between the tip of Land’s End and St. Mary’s is today calm and gentle, and we make good progress, despite the wind and drizzle lashing us on deck. Hugh Town doesn’t so much loom into view but appear before our very eyes, such is the state of the mist. Docking at low tide here is a complex business, with very little clearance between the bottom of the ship and the seabed. This, added to the fact that Hugh Town’s Harbour is very much a working port, with boats constantly coming and going, means that Master David Redgrave and his team need to be ahead of the game, and ahead of the ship, when coming alongside. The best bit about it is that this carefully choreographed routine happens day in, day out, with the passengers none the wiser. All in a day’s work. With the necessary freight loaded for the return journey, and a few hours to rest up, the Scillonian leaves the Isles of Scilly full of day trippers, and longer stayers, who have all sampled some of what makes these islands so magical. The return journey is a relaxed affair, with many dozing off after a quick pint and a strenuous day in the great outdoors. 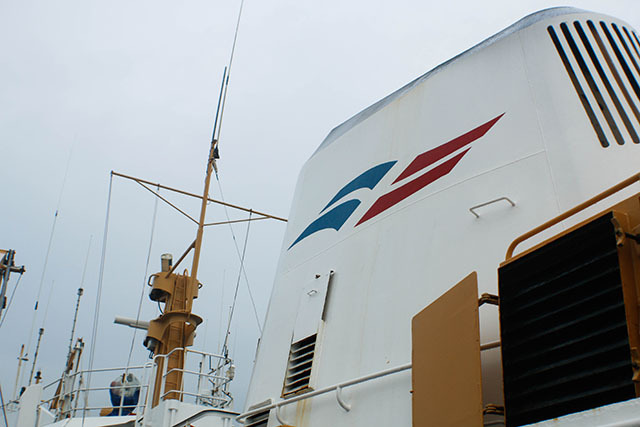 As the Scillonian III pulls into Penzance harbour and the inevitable melee of bag collection and pick-up ensue, everyone remarks on a time well spent – not just on the islands themselves but on the very ship that took them there. At about 8pm the ship’s generators are switched off, the lights are dimmed and the Lighthouse Pier descends into evening peace, ready for another trip tomorrow. 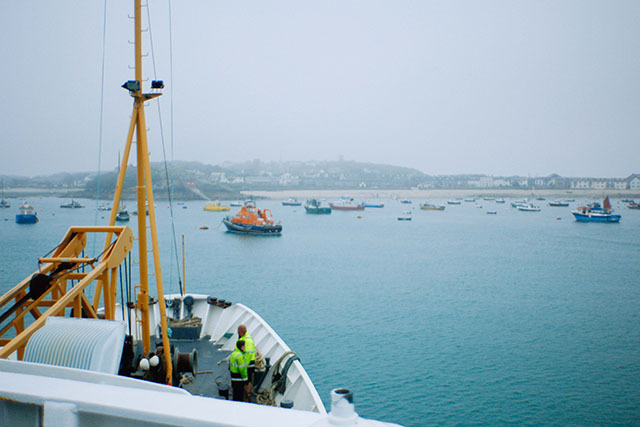 The Scillonian III sails daily between Penzance and St Mary’s from Easter to November, sailing time 2 hours 45 minutes. Daytrips available. For more information visit islesofscilly-travel.co.uk. Get in touch via email, Twitterand Instagram.